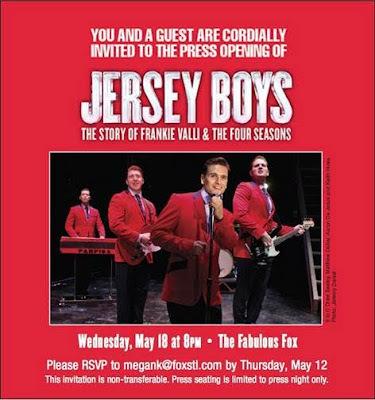 Casting has been announced for the St. Louis engagement of the Tony, Grammy and Olivier Award-winning hit musical JERSEY BOYS, the story of Frankie Valli and The Four Seasons, playing at the Fox Theatre May 18-22. The cast of JERSEY BOYS will be led by Matthew Dailey (Tommy DeVito), Aaron De Jesus (Frankie Valli), Keith Hines (Nick Massi) and Drew Seeley (Bob Gaudio) as The Four Seasons, with Barry Anderson and Thomas Fiscella. Tickets for Jersey Boys at the Fabulous Fox are on sale now online at MetroTix.com, by calling 314-534-1111 or in person at the Fabulous Fox Box Office. Ticket prices start at $25. Prices are subject to change; please refer to FabulousFox.com for current pricing. Jersey Boys is part of the U.S. Bank Broadway Series. 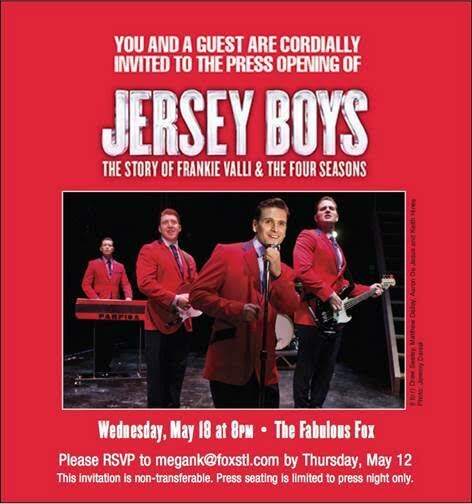 Performances of Jersey Boys at the Fabulous Fox run May 18 – 22. Show times are Wednesday through Saturday evenings at 8 p.m., Thursday afternoon at 1 p.m., and Saturday afternoon at 2 p.m. There will also be an afternoon performance on Sunday, May 22 at 1 p.m. and an evening performance at 6:30 p.m. The ensemble of JERSEY BOYS includes Tommaso Antico, Jaycie Dotin, De’Lon Grant, Wes Hart, Bryan Hindle, Miguel Jarquin-Moreland, Austin Owen, Kristen Paulicelli, Leslie Rochette, Jenna Nicole Schoen, Dru Serkes, Jonny Wexler and Keith White. JERSEY BOYS is the winner of the 2006 Best Musical Tony Award®, the 2006 Grammy Award® for Best Musical Show Album, the 2009 Olivier Award for Best New Musical and the 2010 Helpmann Award for Best Musical (Australia). JERSEY BOYS worldwide has been seen by over 22 million people (as of January, 2015). Directed by two-time Tony® Award-winner Des McAnuff, JERSEY BOYSis written by Academy Award-winner Marshall Brickman and Rick Elice, with music by Bob Gaudio, lyrics by Bob Crewe and choreography by Sergio Trujillo. JERSEY BOYS opened at the August Wilson Theatre on Broadway to critical acclaim on November 6, 2005. The JERSEY BOYS First National Tour opened to rave reviews in San Francisco on December 1, 2006, played a record-breaking run in Los Angeles and is still breaking house records in cities across North America.JERSEY BOYS is currently playing in New York; Las Vegas; London; and in cities across North America and the U.K . on National Tours. The JERSEY BOYS design and production team comprises Klara Zieglerova(Scenic Design), Jess Goldstein (Costume Design), Howell Binkley (winner of the 2006 Tony® Award for his Lighting Design of JERSEY BOYS), Steve Canyon Kennedy (Sound Design), Michael Clark (Projections Design), Charles LaPointe (Wig and Hair Design), Steve Orich (Orchestrations) and Ron Melrose(Music Supervision, Vocal/Dance Arrangements & Incidental Music). JERSEY BOYS is produced by Dodger Theatricals, Joseph J. Grano, Tamaraand Kevin Kinsella, Pelican Group, with Latitude Link and Rick Steiner. The Original Broadway Cast Recording of JERSEY BOYS, produced by Bob Gaudio, was certified Platinum by the Recording Industry Association of America. The cast recording is available on Rhino Records. JERSEY BOYS: The Story of Frankie Valli & The Four Seasons (Broadway Books) is the official handbook to the smash Broadway hit. Seasons Greetings: A JERSEY BOYS Christmas, a holiday CD featuring international cast members of JERSEY BOYS, produced by Bob Gaudio, is available on Rhino Records. DREW SEELEY (Bob Gaudio) Broadway: The Little Mermaid (Prince Eric); North/South American tours:High School Musical: The Concert (Troy Bolton); Film: Another Cinderella Story, Freshman Father, Do Over; TV: Glory Daze, Lovestruck, One Tree Hill. Check out my music at www.drewseeley.com and twitter/instagram (@DrewSeeley). March 29, 2016 - Casting has been announced for the brand new production of THE SOUND OF MUSIC, directed by three-time Tony Award® winner Jack O’Brien. 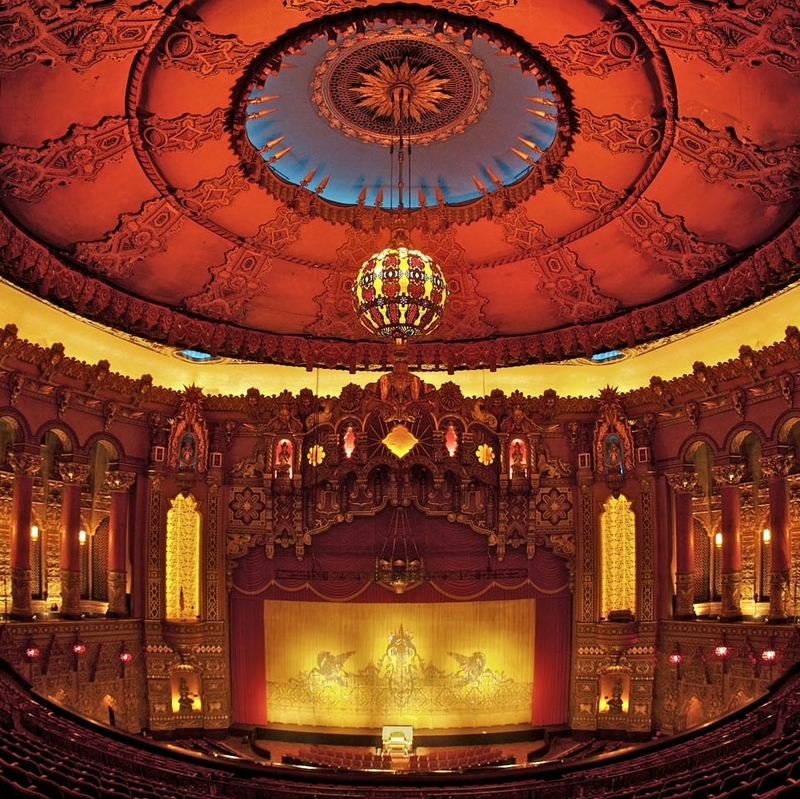 This lavish new production premieres in St. Louis at the Fabulous Fox Theatre April 26 – May 8. Tickets for THE SOUND OF MUSIC at the Fabulous Fox are on sale now online at MetroTix.com, by calling 314-534-1111 or in person at the Fabulous Fox Box Office. Ticket prices start at $30. Prices are subject to change; please refer to FabulousFox.com for current pricing. THE SOUND OF MUSIC is part of the U.S. Bank Broadway Series. Performances of THE SOUND OF MUSIC at the Fabulous Fox run April 26 – May 8. Show times are Tuesday through Saturday evenings at 7:30 p.m., Saturday afternoons at2 p.m. and Sunday afternoons at 1 p.m. There will also be a performance on Sunday, May 1, at 6:30 p.m. and Thursday, May 5 at 1 p.m.
BEN DAVIS (Broadway’s Violet, A Little Night Music, La Bohème) will play Captain Georg von Trapp and MELODY BETTS will play The Mother Abbess with MERWIN FOARD as Max Detweiler, TERI HANSEN as Elsa Schraeder, DAN TRACY as Rolf and PAIGE SILVESTER as Liesl. The von Trapp children will be played by ERICH SCHUETT (Friedrich), MARIA KNASEL (Louisa), QUINN ERICKSON (Kurt), SVEA JOHNSON (Brigitta), MACKENZIE CURRIE (Marta) and AUDREY BENNETT (Gretl). And introducing Jack O’Brien’s brand new discovery, KERSTIN ANDERSON as Maria Rainer. A current student at Pace University, Ms. Anderson won the coveted role from hundreds who auditioned. This will be her first national tour. The ensemble includes Carey Rebecca Brown, Ron Brown, Caitlin Burke, Christopher Carl, Kyla Carter, Austin Colby, Daniella Dalli, Elisabeth Evans, Donna Garner, Meghan Hales, Jenavene Hester, Adam Hill, Jeremy Lanuti, Darren Matthias, Kelly McCormick, Julia Osborne, Andrea Ross, Brent Schindele and Jim Schubin. THE SOUND OF MUSIC features music by Richard Rodgers, lyrics by Oscar Hammerstein II, book by Howard Lindsay and Russel Crouse, suggested by The Trapp Family Singers by Maria Augusta Trapp. This new production is directed by Jack O’Brien (credits include: Hairspray, The Full Monty, Dirty Rotten Scoundrels, The Coast of Utopia), choreographed by Danny Mefford (Fun Home, The Bridges of Madison County and Bloody Bloody Andrew Jackson) and music supervision by Andy Einhorn (Bullets Over Broadway, Rodgers & Hammerstein’s Cinderella, Brief Encounter, The Light in the Piazza). The design and production team is comprised of Douglas Schmidt, set design (Tony Award® nominee: 42nd Street, Into the Woods); Jane Greenwood, costume design (2014 recipient of the Special Tony Award® for Lifetime Achievement in the Theatre), Natasha Katz, lighting design (Five-time Tony Award® winner: An American in Paris, Once, Aida, The Coast of Utopia, The Glass Menagerie) and Ken Travis, sound design (Aladdin, Newsies, Memphis). Casting by Telsey + Company/Rachel Hoffman, CSA. For more information, please visit www.TheSoundOfMusicOnTour.com. 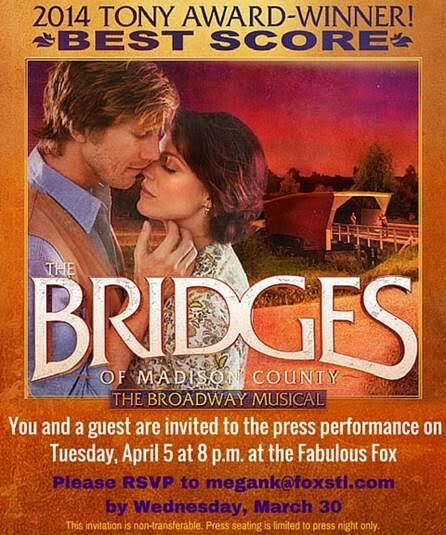 Tickets for THE BRIDGES OF MADISON COUNTY at the Fabulous Fox are on online at MetroTix.com, by calling 314-534-1111 or in person at the Fabulous Fox Box Office. Ticket prices start at $20. Prices are subject to change; please refer to FabulousFox.com for current pricing. THE BRIDGES OF MADISON COUNTY is part of the U.S. Bank Broadway Series. THE BRIDGES OF MADISON COUNTY starring Elizabeth Stanley (On the Town, Million Dollar Quartet) as Francesca and Andrew Samonsky (The Hunchback of Notre Dame, South Pacific) as Robert, makes its St. Louis Premier April 5-17 at the Fabulous Fox Theatre. Show times are Tuesday through Saturday evenings at 8 p.m., Saturday afternoons at 2 p.m. and Sunday afternoons at 1 p.m. There will also be an evening performance on Sunday, April 10 at 6:30 p.m. and a matinee performance on Thursday, April 14 at 1 p.m.
Based on the best-selling novel by ROBERT JAMES WALLER, THE BRIDGES OF MADISON COUNTY tells the story of Iowa housewife Francesca Johnson and her life-changing, four-day whirlwind romance with traveling photographer Robert Kincaid. It’s an unforgettable story of two people caught between decision and desire, as a chance encounter becomes a second chance at so much more. The cast includes Cullen R. Titmas (The Last Ship, Avenue Q) as Bud, Mary Callanan(Mamma Mia!, Annie) as Marge,David Hess (Sweeney Todd, Annie Get Your Gun) as Charlie, John Campione (Bonnie and Clyde , Les Misérables) as Michael, Caitlin Houlahan (Parade at Lincoln Center) as Carolyn and Katie Klaus (The Bridges of Madison County Original Broadway Cast Member, Bonnie & Clyde) as Marian/Chiara/State Fair Singer. The ensemble comprises Cole Burden (Les Misérables), Caitlyn Caughell (Newsies), Brad Greer (I Am Harvey Milk at Lincoln Center), Lucy Horton (Cats), Amy Linden (Cheer Wars), Trista Moldovan (The Phantom of the Opera), Jessica Sheridan (Sister Act), Matt Stokes(Jesus Christ Superstar), Tom Treadwell (Annie) and Bryan Welnicki (Peter and the Starcatcher). The critically acclaimed musical features one of Broadway’s most accomplished creative teams with music and lyrics by three-time Tony Award®-winning composer JASON ROBERT BROWN (Parade, The Last Five Years), book by Pulitzer Prize-winning writer MARSHA NORMAN (The Secret Garden, The Color Purple, ‘night, Mother) and direction by Tony Award®-winner BARTLETT SHER (South Pacific, The King & I, The Light in the Piazza), recreated by TYNE RAFAELI (Fiddler on the Roof, The King & I). The team also includes scenic design by two-time Tony Award®-winner MICHAEL YEARGAN (The Light in the Piazza, South Pacific), costume design by six-time Tony Award®-winner CATHERINE ZUBER (The King and I, South Pacific, The Light in the Piazza), lighting design by two-time Tony Award®-winner DONALD HOLDER (South Pacific, The Lion King), sound design by JON WESTON (Les Misérables, The Color Purple), wig and hair design by DAVID BRIAN BROWN (Curious Incident, Sister Act), arrangements and orchestrations by JASON ROBERT BROWN, music supervision by TOM MURRAY (The Last Five Years, Parade), movement by DANNY MEFFORD (Fun Home, Bloody Bloody Andrew Jackson) and casting by TELSEY + COMPANY/CESAR ROCHA, CSA. Live at the Fabulous Fox Saturday, October 8 at 7:30 p.m.
Tickets go on sale Friday, April 4 at 10AM online at metrotix.com, by calling 314-534-1111, or in person at the Fabulous Fox Box Office. 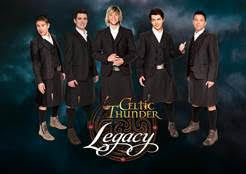 March 29, 2016 – Storming onto the main stage are international megastars Celtic Thunder, with LEGACY, a brand new show that celebrates the influence of Irish and Celtic music around the world. LEGACY is a live show featuring a mix of lively, fast paced and upbeat songs “A Place in The Choir” “Galway Girl” and “Raggle Taggle Gypsy” that represent the fun loving nature of the Irish and slower classic ballads “Danny Boy” “Noreen” and “Buachaille On Eirne” that portray a more nostalgic and romantic side. Continuing their tradition of paying homage to the musical culture and traditions of Ireland, Celtic Thunder’s latest show is a depiction both their musical footprint over the past 8 years as well as their amazing heritage of Irish and Celtic music. Both the ensemble and solo performances in this thrilling evening of entertainment highlight the diversity of Irish music and song. Powerful anthems Ireland’s Call and Caledonia, heartwarming ballads Song For The Mira and Take Me Home and lively crowd favorites such as Seven Drunken Nights all serve to showcase the musical talent of each soloist. Formed in Dublin in 2007, Celtic Thunder is a multi-dimensional musical and theatrical ensemble celebrated around the world for emotionally powerful performances and a state-of-the-art production. Billboard magazine has named Celtic Thunder the Top World Album Artist (in 2008, 2009 2011 and 2015) while the group has had LPs placed in the World Album Top 10 every year since 2008. Celtic Thunder features five male vocalists backed by the amazing 8-piece Celtic Thunder band, ensuring that Celtic Thunder LEGACY has something special something to offer to everyone. CELTIC THUNDER is produced by Sharon Browne. FABULOUS FOX THEATRE ANNOUNCES 2016–2017 U.S. BANK BROADWAY SERIES! New six-show season ticket packages will go on sale May 15. Current U.S. Bank Broadway season subscribers will receive their renewal information beginning the week of March 28. On-sale dates for individual shows will be announced later. 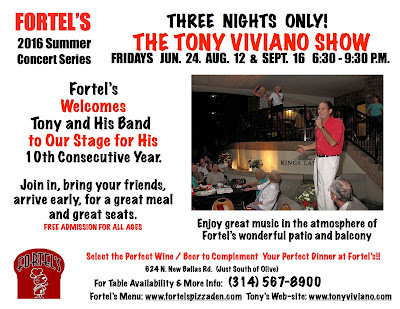 For more information, please call the Fox Subscription office at314-535-1700. 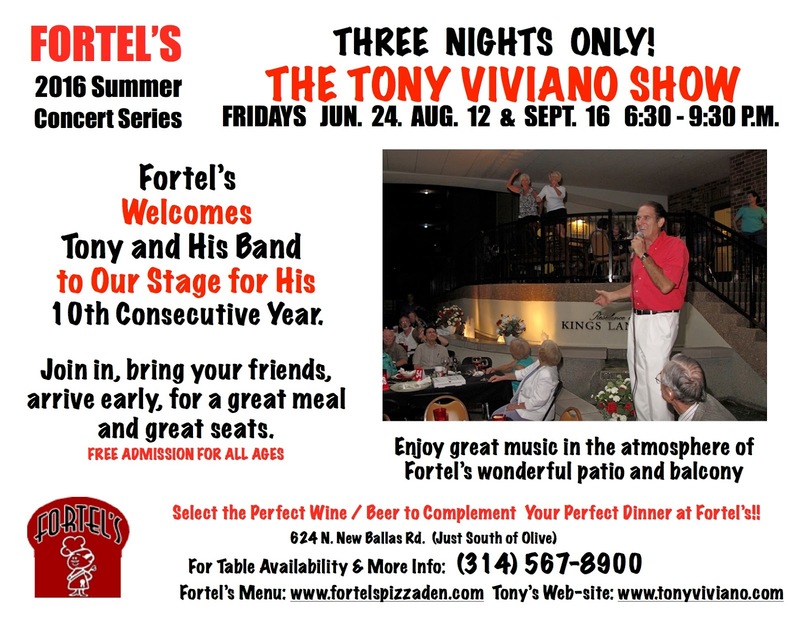 Groups of 15 or more should call 314-535-2900 for special rates and reservations. 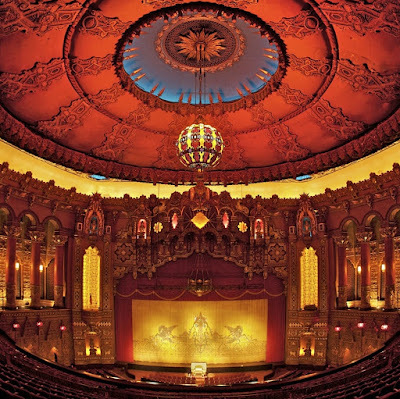 The Broadway Series at the Fabulous Fox Theatre is presented by U.S. Bank. March 22, 2016 – The Fabulous Fox Theatre announces an extraordinary season of Tony Award®-winning Best Musicals in the 2016–2017 U.S. Bank Broadway Series including FUN HOME, Fox Theatricals’ own critically-acclaimed 2015 Tony Award–winning Best Musical. FUN HOME is one of six shows making its St. Louis debut and one of seven shows in this season’s lineup which can claim the Tony Award for Best Musical honor. In addition to FUN HOME the six-show season ticket package includes the season opener A GENTLEMAN’S GUIDE TO LOVE & MURDER, winner of the 2014 Tony Award for Best Musical. The magical FINDING NEVERLAND will visit the Fox during the December holidays; the romantically beautiful AN AMERICAN IN PARIS kicks off 2017; and the hilarious smash SOMETHING ROTTEN! visits in February. Closing out the season is Roundabout Theatre Company’s acclaimed masterpiece CABARET, one of a select group of musicals that has received the Tony Award for Best Musical and Best Musical Revival. Plus seven specials are in the lineup, four of which received the Best Musical Tony Award including Disney’s THE LION KING returning for a three-week engagement. It is with tremendous pride that we bring Fox Theatricals’ Tony Award®-winning production of FUN HOME to the Fabulous Fox. Every once in a while a Broadway musical comes along that surprises, moves and excites audiences in ways only a truly landmark musical can. The “groundbreaking,” “life-affirming” and “exquisite” new musical FUN HOME was the event of the 2015 Broadway season, receiving rave reviews from critics and audiences alike, winning five 2015 Tony Awards including Best Musical and making history along the way. Based on Alison Bechdel’s best-selling graphic memoir, FUN HOME introduces us to Alison at three different ages as she explores and unravels the many mysteries of her childhood. A refreshingly honest musical about seeing your parents through grown-up eyes, “FUN HOME is extraordinary, a rare beauty that pumps fresh air into Broadway!” (The New York Times). Broadway’s biggest new hit and the winner of Broadway.com’s Audience Choice Award for Best Musical, this breathtaking smash “captures the kid-at-heart,” says TIME Magazine. Vogue cheers, “It’s a must-see you’ll remember for years to come!” Directed by visionary Tony®-winner Diane Paulus and based on the critically-acclaimed Academy Award® winning film starring Johnny Depp, FINDING NEVERLAND tells the incredible story behind one of the world’s most beloved characters: Peter Pan. Playwright J.M. Barrie struggles to find inspiration until he meets four young brothers and their beautiful widowed mother. Spellbound by the boys’ enchanting make-believe adventures, he sets out to write a play that will astound London theatergoers. With a little bit of pixie dust and a lot of faith, Barrie takes this monumental leap, leaving his old world behind for Neverland, where nothing is impossible and the wonder of childhood lasts forever. The magic of Barrie’s classic tale springs spectacularly to life in this heartwarming theatrical event. FINDING NEVERLAND is “far and away the best musical of the year!” (NPR). AN AMERICAN IN PARIS is the new Tony Award®-winning musical about an American soldier, a mysterious French girl, and an indomitable European city, each yearning for a new beginning in the aftermath of war. Acclaimed director/choreographer and 2015 Tony Award®-winner Christopher Wheeldon brings the magic and romance of Paris into perfect harmony with unforgettable songs from George and Ira Gershwin in the show that earned more awards than any other musical in the 2015 season! The New York Times raves, “AN AMERICAN IN PARIS is a triumph! Pure joy!” and the Wall Street Journal declares, “Once you’ve seen it, you’ll find it hard to settle for less ever again.” Don’t miss this stunning Broadway hit when it arrives in St. Louis on its first national tour! Direct from Broadway, the acclaimed masterpiece returns to St. Louis! As part of its 50th Anniversary Season, the critically acclaimed and award-winning Roundabout Theatre Company is proud to present Sam Mendes (Skyfall, American Beauty) and Rob Marshall’s (Into the Woods and Chicago, the films) Tony Award®-winning production of CABARET. Come hear some of the most memorable songs in theatre history, including “Cabaret,” “Willkommen” and “Maybe This Time.” Leave your troubles outside – life is beautiful at CABARET, John Kander, Fred Ebb and Joe Masteroff’s Tony-winning musical about following your heart while the world loses its way. Seven specials for the 2016–2017 Season will be offered to season ticket-holders for priority seating before their public on-sale dates. The captivating and breathtakingly romantic ONCE (2012 Tony Award® for Best Musical), returns to the Fox September 30–October 2. One of the world’s best-loved family musicals ANNIE (1977 Tony Award for Best Musical) hits the stage December 2–4. Featuring more than 40 classic hits such as “My Girl” and “Ain’t No Mountain High Enough”, the true American dream story of Motown founder Barry Gordy MOTOWN THE MUSICAL returns March 21–26. THE ILLUSIONISTSTM–Live From BroadwayTM will make its St. Louis debut March 31-April 2. Experience the phenomenon of Disney’s THE LION KING April 19-May 7. Winner of six 1998 Tony Awards® including Best Musical, this landmark musical event brings together one of the most imaginative creative teams on Broadway. THE LION KING also features some of Broadway’s most recognizable music, crafted by Tony Award-winning artists Elton John and Tim Rice. “There is simply nothing else like it” proclaims the New York Times and the 432,000 people who experienced one of its three previous Fox engagements will surely agree. Have the time of your life when DIRTY DANCING–The Classic Story On Stage returns May 12-14 with its heart-pounding music and sensational dancing. As a season finale, the 1996 Pulitzer Prize and Tony Award®-winning Best Musical RENT stops at the Fox May 19-21 during its 20th anniversary tour. 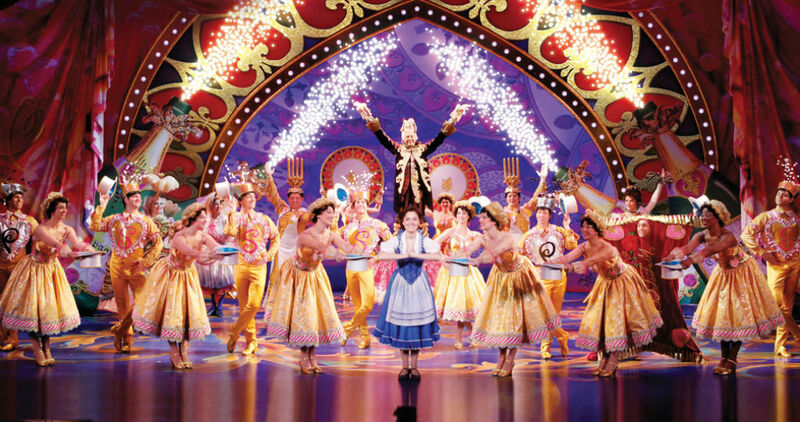 Disney’s BEAUTY AND THE BEAST, the smash hit Broadway musical, is returning to St. Louis. Based on the Academy Award®-winning animated feature film, this eye-popping spectacle has won the hearts of over 35 million people worldwide. This classic musical love story is filled with unforgettable characters, lavish sets and costumes, and dazzling production numbers including “Be Our Guest” and the beloved title song. Experience the romance and enchantment of Disney’s BEAUTY AND THE BEAST at the Fabulous Fox! Disney’s BEAUTY AND THE BEAST is the classic story of Belle, a young woman in a provincial town, and the Beast, who is really a young prince trapped in a spell placed by an enchantress. If the beast can learn to love and be loved, the curse will end and he will be transformed to his former self. But time is running out. If the Beast does not learn his lesson soon, he and his household will be doomed for all eternity. Everyone is required to have a ticket for admittance to this show – regardless of age.